Submitted by lynn on Monday, December 30, 2013 - 8:31pm. Our second visit to Old Town this December was Miguel's Cocina, another restaurant we originally found through Tequila Trail 2012. I picked this place to celebrate my birthday with friends and it was a great choice! The patio area was roomy and filled with sunshine and smiles of course, because they get to spend time with meeee! After eating out multiple times in the last week, I decided to go a little healthier with a southwestern flare and ordered the Fiesta Salad for $13. 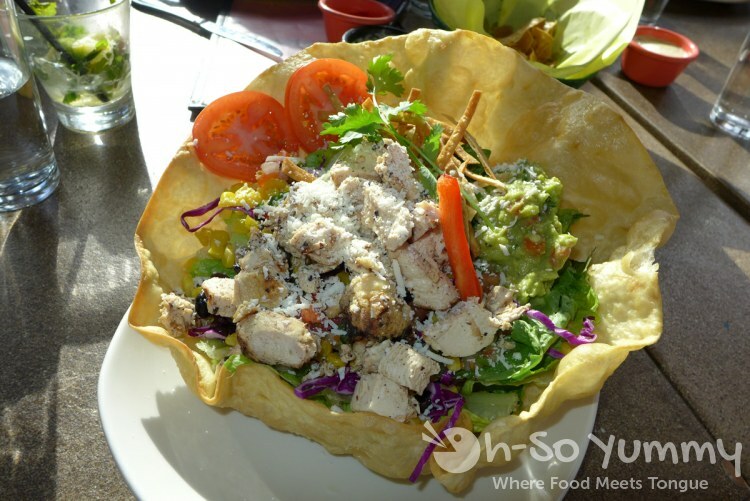 This was a crispy flour tortilla shell filled with mixed greens, black beans and roasted corn, salsa fresca and guacamole, and topped with grilled pollo asado. I asked for the creamy chipotle dressing on the side. Some sections of the salad, especially near the guac and other moist ingredients were fine without the dressing (or per my preference). On the drier sections, which were straight up lettuce and beans or similar, a little bit of dressing helped it all go down the hatch. Amazingly, I put a humongous dent into this flaky shell and pretty much finished all the scrumptious goodies inside. Go me! After reviewing the menu, Dennis declared "I'm getting that shrimp we sampled at Tequila Trail 2013!" 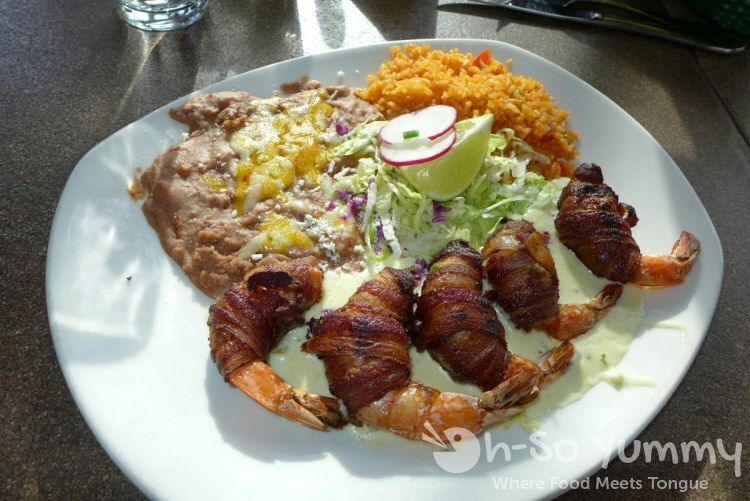 And there is Camarones Jalisco shrimp pictured above in all its glory! This dish was five jumbo shrimp stuffed with monterey jack cheese and rajas, wrapped in bacon and grilled, topped with jalapeño white sauce, and served with the normal rice and beans fixings. It was $18 for this dish which I think is somewhat pricey for only 5 shrimp, but he enjoyed every savory baconed bite of them. Between the two meals, we stuffed ourselves silly! For my birthday, Dennis picked up a delicious Elby cake from Sage French Cake bakery, which is one of my favorite cakes in San Diego. Our party was ready for dessert but there was one interesting hiccup: if we cut the cake ourselves, there was a cake cutting fee; if the restaurant staff cut the cake, the fee was waived. Sooooo, we let them slice up our cake for us before we devoured it! To sum it up, everyone had PLENTY of food to eat and had quite an enjoyable lunch with fun company. I think Miguel's Cocina was a foodie hit and I am glad we made it back after two Tequila Trail samplings! Is this restaurant a chain? Is this the one that has the free cheese dip for their chips? I might be confused b/c I think i went to the same named restaurant in 4S ranch I think. Happy belated bday! I knew INSTANTLY that was an Elby cake from Sage b/c i LOVE that cake. The restaurant's cake cutting policy is hilarious. Less work for you though so yeah! I actually didn't know it was a chain until I visited their website! We found it through an old town event last year so it was always in the back of my mind to come back. 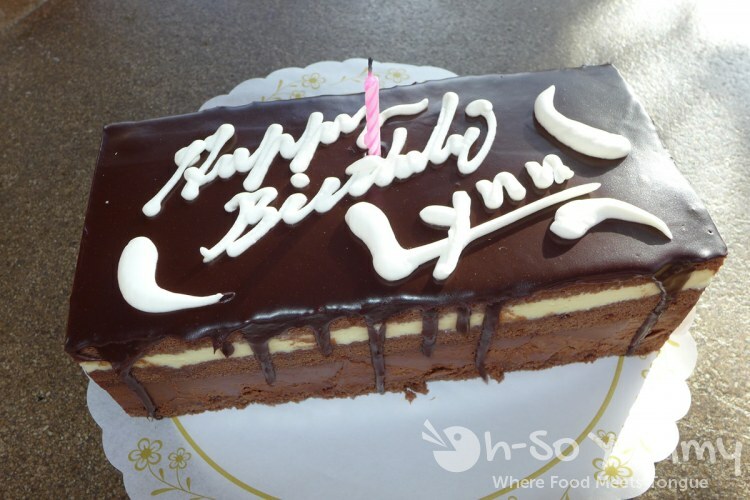 My favorite cake is the Princess Cake from Champagne French Bakery Cafe. I've had that multiple times for birthdays.